Important Note: On 29th November 2018, L.Type prints announced that they had ceased trading. An image comes alive when it’s printed. Holding a photograph in your hand rather than just looking at it on a screen can give a completely different perspective on the composition and even reveal technical flaws that previously went unnoticed, but more importantly it provides more of an emotional connection with the scene. L.Type prints are 400 dpi true continuous tone and marry silver halide printing with colour negative photographic media in a process that’s best described by LumeJet themselves, so click here if you’d like to read more of the technical stuff. In a nutshell, what one can expect is a print without any colour banding, has deep blacks, incredible resolution and is pin sharp across the entire image (source material depending), but will the end result be better than images from a high-end ‘prosumer’ A3 printer such as a Canon Pixma Pro-1000? It’s important to note here that other than providing the great offer for my website visitors below - thanks to the L.Type team - I have no affiliation with LumeJet and as they say, your mileage may vary. On A3 paper, a full-bleed image at 400 dpi requires an image resolution 6614 × 4677 to realise the full print potential, where one pixel in the image is one point in the print. That’s a lot of pixels; almost 31-megapixels. L.Type advise sending the largest files you have, so this is where a 8688 × 5792 5DS file comes in really handy, especially if the original image is cropped in any way. Lower resolution source files still look great, but native 400 dpi is the holy grail. Although they will accept images with any colour space, L.Type ask you to ideally supply images in the Adobe RGB colour space, so soft-proofing on a calibrated monitor is important. This will allow you to preview your images as they will appear on their range of papers and an ICC profile for each can be downloaded from the L.Type website. L.Type images aren’t sharpened at the print stage - in fact LumeJet won’t alter the original files in any way unless you ask them to - so sharpening at this stage is key. Remember to consider the viewing distance of a print rather than on-screen, and that monitors are generally 72 dpi (equivalent) rather than the 400 dpi goal. I use a Lightroom plug-in from DxO called Nik Sharpener Pro 3, and there are earlier free versions floating around the Internet from when Google decided to purchase Nik. Of course, you can also sharpen natively in Lightroom, Photoshop or CaptureOne, but be aware that inkjet printers automatically add a sharpening effect, whereas L.Type does not, and if you have the option, select sharpen for print and continuous tone, 400 dpi options (if you have them). Before ordering it’s worth deciding on paper stock, image quantities and file types. L.Type have a great first-order offer (read more below) using their default paper type, Fujifilm Crystal Archive Professional DPII Matte at 530gsm, so I decided to stick with that rather than go with 830gsm. When your first order arrives LumeJet will also include paper samples - matte, glossy and premium glossy - so that going forward different stock can be selected. Files can be uploaded via an iOS app, via WeTransfer or the newly-introduced on-line ordering portal, which is a welcome addition. I found uploading via WeTransfer worked well, especially when sending uncompressed TIFF files in the region of 300Mb in size, but on occasion the chain of emails that followed could be a little confusing - some from different addresses and others that appeared to duplicate information. That said, email communication with LumeJet is largely excellent, with quick responses via their ticket system and some great information. The lesson here is: if you’re not sure of something, just ask. The new web portal is the easiest and most accessible way of doing things - choose your print/aspect ratio and upload an image. The web interface is limited to 100Mb files, but you can connect a Google Drive or DropBox account. It’s just a case of choosing an aspect ratio to match the image and uploading the file. The site will warn you if the image resolution is too low and allow you to adjust any crops. LumeJet will then send a contact sheet of images to be printed, and if you’re happy payment can be made online. My first contact sheet included a wayward image, but was quickly corrected and proved the value of an approval loop prior to print. 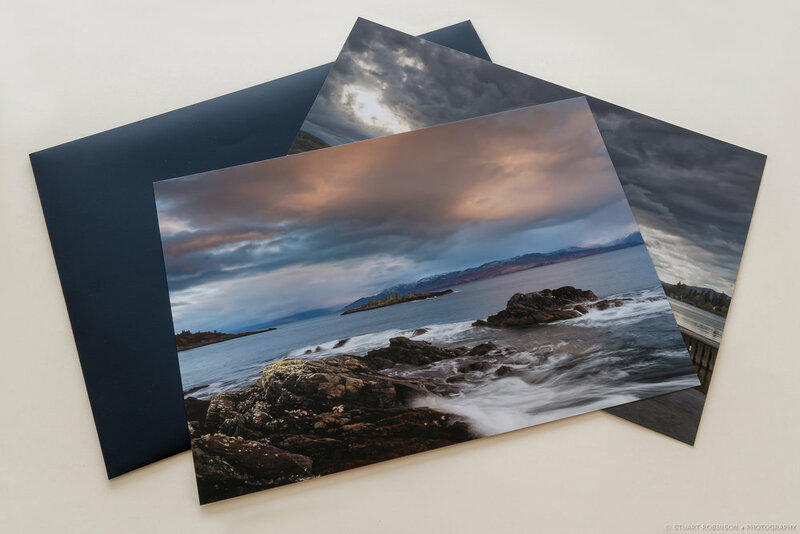 L.Type prints arrive in a robust cardboard package, within which is a high-quality black envelope and sealed plastic sleeve containing the images themselves. While all of this inspires confidence, the prints themselves are really what matter and… they’re beautiful. I deliberately chose images that were a challenge to print, lots of gradients, blue skies, dark shadows and fine detail, and was thoroughly impressed with the results. The colours matched the images as prepared on my calibrated screen almost precisely, yet had a wider visible gamut and most importantly, no banding whatsoever. Image sharpness was just right, but it’s possible to push your images a little further with the L.Type process than standard inkjet before seeing edge halos, so that’s worth bearing in mind. The paper stock is excellent too, is perfect for mounting and I found that even handing unmounted prints to a client resulted in some “wow, these are beautiful” comments, just what every photographer wants to hear! So are the prints better than those from a Pixma Pro? Undoubtedly yes, even with some really high-quality paper in the Canon. L.Type images are ‘smoother’, more natural, and have less of the edge-enhanced nature of some inkjet prints. If you’re printing professionally - for example selling prints on your website - then L.Type prints provide a high standard of reproduction that will delight clients and offer maximum longevity. Yes, there are some drawbacks to not having a printer on-site; for example it’s much harder to make small tweaks and see what impact they have on the end result, but there are the costs to consider too; a single A3 L.Type print on Fujifilm matte paper will cost between £10 and £17 (there are discounts the more you print) and there’s typically £5 post-and-packing, so weigh that against the price of a printer such as the Pixma plus ink and paper. My advice would be to purchase a mid-level A4 inkjet to print your photos at home, pin it to a wall for a week and only send the images that you like best to L.Type. In addition to single-sided prints, L.Type can create double-sided, portfolio prints (mounted) box sets, photobooks, can frame prints for you and even print 1m wide panoramas. Check out their website for more information.